ProFold™-C1 baculovirus genomic vector DNA enables active folding of difficult target proteins in the cytoplasm using major human molecular chaperones Hsp40 (NCBI Acc# BAA02656) and Hsc70 (NCBI Acc# AAK17898), (rationale). Genes encoding these chaperones are inserted into the baculovirus genome distal to the polyhedrin site (Fig. 1). The polyhedrin site is reserved for insertion of a target gene under control of the strong polyhedrin promoter. Initially, the polyhedrin site is occupied by E.coli β-galactosidase gene. To allow insertion of a target gene, β-galactosidase gene was removed from the baculovirus DNA using Bsu36.I restriction endonuclease, which cleaves immediately downstream of the polyhedrin promoter, in the β-galactosidase gene and in the downstream essential gene ORF 1629. In addition to the chaperone genes, ProFold™-C1 encodes Aequorea victoria green-fluorescent protein (GFP) that is also distal to the polyhedrin site. Expression of GFP allows for convenient monitoring of recombinant baculovirus infection. GFP, Hsp40 and Hsc70 are expressed very late in infection, at about the same time as the target protein. ProFold™-C2 is very similar to ProFold™-C1. The only difference on the DNA level is that Hsp40 is expressed under control of a stronger promoter. Consequently, ProFold™-C2 drives higher expression levels of Hsp40 than ProFold™-C1, but ProFold™-C1 is typically capable of expressing proteins inserted into the polyhedrin site to a higher level (Fig. 2). Fig. 1. Schematic representation of ProFold™-C1 DNA. Arrangement of genes in ProFold™-C2 DNA is the same, the only difference is a stronger promoter used for expression of Hsp40. Hsp40, Hsp70 and GFP genes are designated by arrows, respective promoters not shown. Polyhedrin promoter is designated by the black triangle. E.coli β-galactosidase gene is originally present in the polyhedrin site. However, in commercially available ProFold™-C1 and –C2 vectors it is removed alongside with a part of an essential gene to allow substitution of β-galactosidase gene for a gene of interest (target gene), refer to TECHNOLOGY for more details. Fig. 2. Protein expression profiles of insect cells infected with BacPAK6™, ProFold™-C1 (C1) and ProFold™-C2 (C2) –based recombinant baculoviruses that are expressing β-galactosidase (β-gal) in the polyhedrin site under control of polyhedrin promoter. β-galactosidase was chosen as a target protein for comparison of the general rate of the protein expression in the polyhedrin site between these vectors as its folding and yield is not chaperone-dependent. Spodoptera frigiperda Sf9 cells were infected with recombinant baculoviruses at multiplicity 5 plaque forming units per cell and harvested at 60 h post infection. Cells were lysed in 50 mM Tris-HCl pH 8.0, 150 mM EDTA, 0.5% NP-40 and the lysate was centrifuged at 30.000g for 15 min. β-galactosidase, Hsp40, Hsc70 and GFP are highly soluble and are found almost exclusively in the supernatant. The supernatant proteins were separated in 11% SDS-PAGE and stained with Coomassie blue. 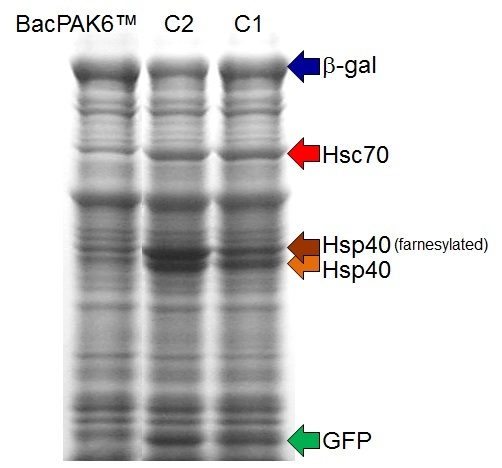 Note that ProFold™-C1 and ProFold™-C2 profiles differ from BacPAK6 in that they contain additional major bands, representing Hsc70, Hsp40 and GFP that are expressed to a high level. Otherwise the profiles are similar. β-galactosidase is expressed to a higher level by BacPAK6 and ProFold™-C1 based baculoviruses then by ProFold™-C2 –based baculovirus. This difference in expression of β-galactosidase is typically representative of the difference in the level of target protein expression between these vectors. ProFold™-C1 vector is most often used for expression of difficult cytoplasmic proteins as it enables co-expression of target protein with molecular chaperones without compromising the general level of target protein expression. However, ProFold™-C2 is recommended for very insoluble proteins (see below). Methods. Go to Baculovirus tutorial for simple step-by-step hands-on instructions. Refer to TECHNOLOGY for conceptual details. You can use the same methods as for BaculoGold™ (BD Pharmingen) if you are already experienced with these vectors. Recommended plasmid transfer vectors. As shown on Fig. 3 below, a large selection of plasmids is compatible with ProFold™-C1 and –C2 vectors to suite various protein expression and purification requirements. A target protein can be expressed with a GST, His, GFP, MBP or dual His/ MBP, or FLAG/His tag or expressed without a tag using the pVL1393 plasmid vector. Additionally, we offer vectors with a highly efficient signal sequence (pAB-bee™, pAB-bee™-8xHis, pAB-bee-FH™ plasmid transfer vectors) to facilitate expression of secreted and membrane proteins. Up to 3 target proteins can be expressed using pAcAB3 vector that is also compatible with ProFold™-C1 and -C2 vectors. You can also use any plasmid transfer vectors that are compatible with BacPAK6™ or BaculoGold™ vectors. Fig. 3. Schematic representation of plasmid transfer vectors compatible with Profold™-C1 and –C2 baculovirus vector DNA. All plasmid transfer vectors have the same plasmid "backbone" that allows plasmid propagation in E.coli (designated by blue double line), but they differ in the part downstream of the polyhedrin promoter (designated by black triangle). Refer to TECHNOLOGY for conceptual details. Click on the plasmid name for detailed information on each plasmid. Click on the Cat# for pricing and ordering. Table 1. Plasmid transfer vectors from other suppliers compatible with ProFold™-C1 and ProFold™-C2. Rationale. About 30% of cell proteins require Hsp40 and Hsp70 group of molecular chaperones for their folding. Though insect cells synthesize these chaperones at the levels which are adequate for insect cell functions, these levels are often insufficient to facilitate folding of target proteins which are synthesized to a much higher level. Consequently, target proteins are often misfolded and form inclusion bodies. To facilitate folding of overexpressed target proteins, we inserted genes encoding these chaperones into baculovirus vector DNA which drives expression of the chaperones to a high level, compatible with the level of synthesis of an overexpressed target protein (Fig. 2). Hsp40(dj2) and Hsc70 that are encoded by ProFold™-C1 and –C2 are natural partners, which cooperate in protein folding in the cytoplasm (Shen et al., J. Biol. Chem., 277: 15947-15956, 2002). Co-infection of insect cells with recombinant baculoviruses expressing human Hsp40 and Hsp70 with Epstein-Barr virus replicating protein BZLF1 resulted in 8 times improvement in the yield of soluble BZLF1 (Yokohama N. et al., Biochim Biophys Acta, 1493: 119-124, 2000). Similarly, soluble and functionally active human LKB1 was produced when co-expressed with these molecular chaperones, while practically no active LKB1 was recovered when it was expressed in baculovirus system not supplemented with these molecular chaperones or in E.coli (Martínez-Torrecuadrada et al., J Biotechnol. 115(1):23-34, 2005). ProFold™-C1 and -C2 enable synthesis of the target protein and molecular chaperones using a single recombinant baculovirus, which is advantageous as compared to co-infections where a target protein and the chaperones are provided using separate recombinant baculoviruses (details). Using ProFold™-C1 or -C2 vectors, we were able to significantly improve solubility of cytoplasmic proteins which were insoluble when expressed using E.coli vectors or conventional baculovirus vectors. Unlike ProFold™-C1 or -C2 vectors, conventional baculovirus vectors rarely exhibit significant improvement in folding of cytoplasmic proteins compared to the same proteins expressed in E.coli. Characterized by the presence of a highly conserved 70-amino acid J domain, Hsp40 activates the ATPase activity of Hsp70 or its homologue Hsc70 and stabilizes their interaction with unfolded substrates. Hsp40 and its homologues, DnaJ-like proteins, can bind to unfolded substrates and inhibit their aggregation, and can target substrates to Hsc70 or recruit Hsc70 proteins to substrates (Naylor D.J. and Hartl F.U., Biochem. Soc. Symp., 68: 45-68, 2001). A substantial part of Hsp40 is farnesylated in insect cells, which is also observed in mammalian cells. Application of ProFold™-C1 and ProFold™-C2 is not strictly limited to the cytoplasmic proteins, as folding of proteins translocated from cytoplasm into other cell compartments may benefit from co-expression with the cytoplasmic chaperones (Ailor E. and Batenbaugh, M.J., Biotechnol. Bioeng., 58: 196-203, 1998; Ngosuvan, J. et al., J. Biol. Chem., 278: 7034-7042, 2003). ProFold™-C1 is your best choice for most cases of cytoplasmic proteins that tend to form inclusion bodies. ProFold™-C1 provides about the same level of target protein expression as BacPAK6, i.e. practically the maximum level that can be achieved in baculovirus system. In addition it facilitates target protein folding, often resulting in expression of soluble protein which otherwise aggregates. Therefore, there is no downside compared to the conventional vectors and there is an upside of a better protein folding. ProFold™-C2 is recommended if target protein is extremely insoluble, especially if you intend to refold it from inclusion bodies. Some cytoplasmic proteins may be largely insoluble even if produced using ProFold™-C1 or -C2 vectors (Fig. 4). 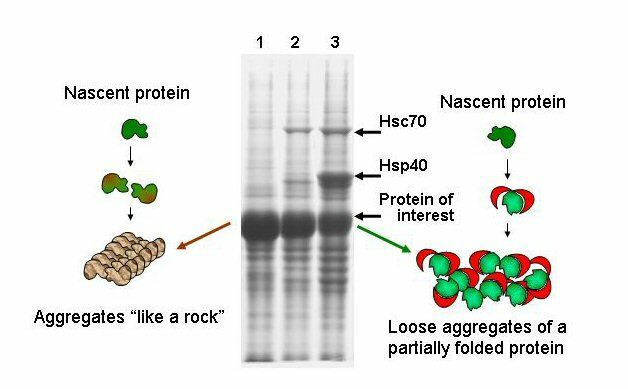 However, inclusion bodies produced using ProFold™-C2 vector differ from typical inclusion bodies in that they usually contain massive amounts of molecular chaperones, especially Hsp40 known to bind nascent proteins. Such inclusion bodies are much more amenable to solubilization at non-denaturing or partially denaturing conditions than typical inclusion bodies which may contain only traces of molecular chaperones. Both Hsp40 and Hsc70 chaperones are highly soluble, therefore the protein aggregate structure containing molecular chaperones is more loose than typical inclusion bodies. If the occasion demands, inclusion bodies can be denatured and chaperones initially contained in the protein preparation can facilitate protein refolding. Incorporation of chaperones into inclusion bodies is specific to their protein folding function. Chaperones do not aggregate in the absence of insoluble protein of interest. Other soluble proteins, for example GFP, are not incorporated into the aggregates. Downside of ProFold™-C2 is reduced level of target protein expression, i.e. about 50% as compared to BacPAK6. However, in some cases this could be advantageous, as synthesis of a target protein is slowed down and the protein is less likely to aggregate. Compared to ProFold™-C1, ProFold™-C2 provides much larger amount of Hsp40. Hsp40 synthesized by ProFold™-C2 is in excess to Hsp70, while lesser than Hsp70 amount is sufficient for operation of Hsp40/Hsp70 chaperone pair. However, Hsp40 is likely to have a chaperone function independent of Hsc70, and even if overexpressed without Hsp70, Hsp40 can reduce target protein aggregation (Bao Y.P. et al., J. Biol. Chem., 277: 12263-12269, 2002). Inclusion bodies produced using BacPAK6 vector (lane 1) required 7M Urea for their solubilization, whereas only 3M urea was sufficient for complete solubilization of inclusion bodies produced using ProFold™-C2 vector (lane 3). pTriEx™, pBAC™, BacMagic™, BacVector™ are trademarks of Novagen; BaculoGold™ is a trademark of BD Pharmingen, flashBAC™ and pOET™ are trademarks of Oxford Expression Technologies (OET), BacPAK™ is a trademark of Clontech, Sapphire™ is a trademark of Orbigen.